It is surprising that there is so little research on textbooks, given their centrality to teaching and learning in elementary and secondary schools. Textbooks have become a focus of political and cultural controversy, advocating a multicultural curriculum that has sparked some vigorous protests. Research is absent in this debate; therefore, questions of legitimate knowledge, the role of textbooks, textbook design, policy selection issues, and economic issues concerning the marketplace are not part of the current debate. Without insights of research on considerate text, mentioning, illustrations and so forth, the current controversy will result in publishers responding to demands for more content not less; thus, textbooks will become compendia of information that on the surface satisfy everyone. 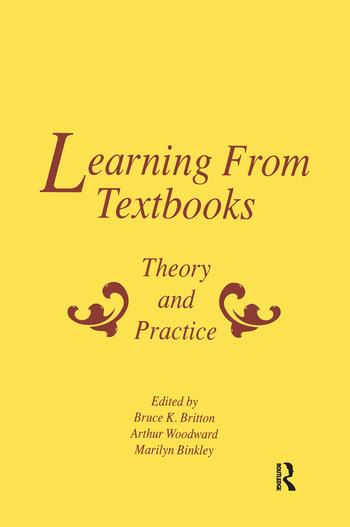 This volume demonstrates how research on important issues relative to textbook design can advance our knowledge about what makes textbooks effective learning tools, and thus inform policymakers, publishers, and those involved in textbook selection. Representing pure and applied approaches, researchers present papers on the quality of writing, the role of questions, the role of pictures and illustrations, and the role of auxiliary materials in the design of effective textbooks. The chapters provide insight into research and its application to textbook design and improvement -- stimulating others to follow this lead. Contents: A. Woodward, Introduction. B.K. Britton, S. Gulgoz, S. Glynn, Impact of Good and Poor Writing on Learners: Research and Theory. R.L. Allington, R-M. Weber, Questioning Questions in Teaching and Learning From Texts. B. Armbruster, J. Ostertag, Questions in Elementary Science and Social Studies Textbooks. J.R. Levin, R.E. Mayer, Understanding Illustrations in Text. A. Woodward, Do Illustrations Serve an Instructional Purpose in U.S. Textbooks? L.M. Anderson, Auxiliary Materials that Accompany Textbooks: Can They Promote "Higher-Order" Learning? J. Osborn, K. Decker, Ancillary Materials -- What's Out There? "...provides valuable research and information on the design, quality, and use of textbooks....an excellent resource for curriculum directors, textbook adoption committees, teacher education faculty and students, and just about anyone interested in textbooks." "...provides a thoughtful examination of an issue that concerns many educators....The [chapter] authors provide needed background to reviewers of textbooks for school district adoption and also to individual teachers who want to be better prepared to mediate textbooks with students. Researchers and graduate students in literacy will find this work quite helpful."